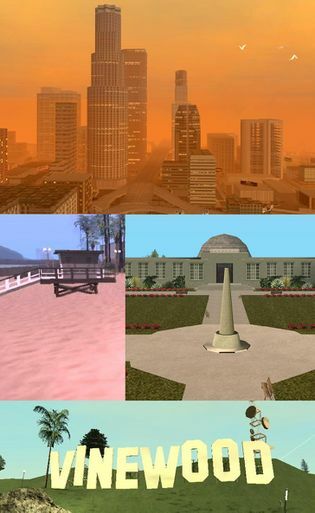 For the city of Los Santos in Grand Theft Auto V, see Los Santos in GTA V.
From to left: Downtown Los Santos, Santa Maria Beach, Los Santos Observatory and Vinewood Sign. Seen in a poster of Umberto Robina's house in GTA Vice City Stories. Night view of Los Santos. Los Santos is a fictional city located in San Andreas, and it is the first city encountered in Grand Theft Auto: San Andreas. Los Santos is the biggest city of the state of San Andreas. Los Santos is based on Los Angeles, California. Los Santos translates to 'The Saints', a play on Los Angeles, meaning 'The Angels'. This also applies to the two cities' nicknames - "The City of Saints" and "City of Angels". Like Los Angeles, Los Santos is a huge, sprawling co-mingling of cultures and perspectives, full of two-bit hoodlums and small-time actors. The population of over 3 million people is divided into 32 districts, which are home to movie and television studios, multi-million dollar estates, crack-ridden ghettos, and a busy international airport. 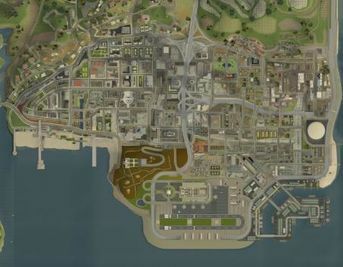 Numerous roads and a central rail line connect Los Santos to San Fierro and Las Venturas. The most infamous street in the city is Grove Street, located in Ganton, southeast of downtown Los Santos, and just minutes south of East Los Santos, which contains a predominantly Hispanic population. Grove Street is home to the Families gang, a once powerful gang whose influence faded due to highly successful drug trafficking by the rival Ballas gang. Los Santos' police are corrupt and the politicians avoid the streets like the plague. There is a motocross track, several basketball courts, and an observatory (modeled after the Griffith Observatory) to satisfy stargazers. Occasionally, independent drug dealers are seen carrying huge wads of cash from recent transactions. Graffiti is commonplace and gambling venues like the racetrack are frequented by many of the city's denizens. The suburbs nestled in the north hills (modeled after the Hollywood Hills) are home to wealthy businessmen, movie stars, and Madd Dogg, the killer rap artist, alike. The occasional shack or trailer park can also be spotted within this highly affluent district, testaments to the period prior to the gentrification of northern Los Santos. 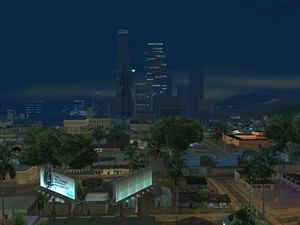 Los Santos is the hometown of GTA San Andreas protagonist Carl Johnson, who returns from living in Liberty City for five years, after his brother informs him of their mother's death. The game starts upon CJ's arrival in Los Santos, and the story revolves around a lengthy gang wars between CJ's gang, the Grove Street Families, and their fiercest rivals, the Ballas. Tensions between rival Hispanic gangs, Varrios Los Aztecas and Los Santos Vagos, also threaten the tenuous hold with which GSF clings to its paltry territories. However, due to the betrayal of senior members Big Smoke and Ryder, GSF leader Sweet Johnson is arrested and CJ is run out of town by C.R.A.S.H., causing the disbandment of the Grove Street Families and the mass takeover of Los Santos by the Ballas and Vagos, with the Ballas taking all of what used to be Grove Street territory. The city is torn apart over the issue of gang warfare. The Grove Street Families and Ballas constantly spar over total dominance in Ganton, Idlewood, Jefferson, Willowfield, and even East Los Santos. In 1992, police officers Frank Tenpenny and Eddie Pulaski of C.R.A.S.H. (Community Resources Against Street Hoodlums) are charged with murder and sexual assault, after their extensive corruption becomes blatantly obvious, even to the general public. However, Pulaski had already been murdered by CJ in the Arco del Oeste area prior to those events, after he and Tenpenny, who were using CJ as their patsy, decide there is no more use for him. Alone at the court hearing, however, Tenpenny is released when the prosecutor inexplicably drops all charges. The entire city, outraged that Tenpenny walks free from horrendously heinous charges of which he is obviously guilty, erupts in riots. This is a reenactment of the L.A. Riots (also known as the Rodney King Riots) after the release of the police officers that brutally beat up Rodney King. During the ensuing chaos, CJ kills cocaine drug lord and ex-gang member Big Smoke. CJ then chases after Officer Tenpenny, who dies when his stolen Fire Truck careens off the side of the overpass over Grove Street. When news of Tenpenny's death reaches the people of Los Santos, the riots cease, and the Grove Street Families regain their spot as the strongest gang in Los Santos (if the player chooses to take over all territories held by the Vagos and Ballas). The "wealthy" side of town containing Vinewood, Rodeo and Mulholland, known around the world as the offices, studios, shopping destinations and homes of the rich and famous. Rodeo Drive (incorporated into Rodeo). Stahl House (as the Mulholland Safehouse). Hollywood Sign (as the Vinewood Sign). Mulholland Drive (incorporated into Mulholland). El Capitan Theater (as the El Dritch Theatre, across the street from Cathay Theater). Randy's Donuts (as Jim's Sticky Ring). Grauman's Chinese Theater (as the Cathay Theater). Capitol Records Tower (as the Blastin' Fools Records Tower). Hollywood Masonic Temple (located just beside El Dritch Theatre, across the street from Cathay Theater). Santa Monica Pier (incorporated into Santa Maria Beach). The "poor" side of the city, made up primarily of lower-class suburbs that are all subject to violent crime, marked by the Ballas-Grove Street War and the area where the Los Santos Riots started, which eventually spread to the entire Los Santos area.. The Forum (as the Los Santos Forum). Union Station (as Unity Station). Shrine Auditorium (as the Alhambra). Terminal Island (incorporated into Ocean Docks). Vincent Thomas Bridge (as the unnamed suspension bridge connecting the Ocean Docks island). The middle section of the city, containing major corporate headquarters in Downtown, civic-minded buildings around Pershing Square, and their airport. Bonaventure Hotel (as the Atrium). City Hall (at Pershing Square). Beverly Hills City Hall (as the Los Santos Police Headquarters at Pershing Square). Biltmore Hotel (at Pershing Square). Los Angeles Convention Center (as the Los Santos Conference Center). 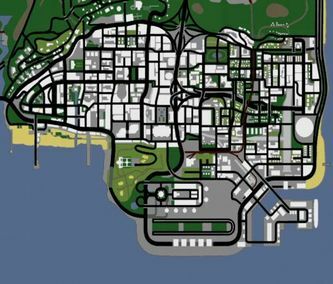 Los Santos is the only city that has gang territories (without exploiting the Territory Glitch). There are 57 territories in Los Santos. 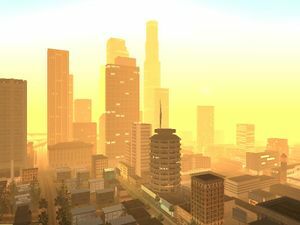 Los Santos generally experiences hot and fine weather, which is frequently accompanied by haze. Occasionally, Los Santos also experiences showers, but almost never thunderstorms which last long. Mist sometimes occurs which usually restricts the player from visualizing the tips of the skyscrapers located throughout Downtown. This page was last modified on 4 March 2015, at 04:41.